Graphics & Appearance: The Golden Sevens slot machine has a very basic, old-school and classic look which gives it certain charm. The symbols are made up by maximum three different colours which make them easy to tell apart. The Golden Seven slot machine is very easy to navigate. Gamble Feature: If you want to gamble a win from the reels, you just click on the Gamble button in the game window. This will take you to the 50/50 Gamble feature where you can double your winnings or lose them. If you win, you will be able to continue to gamble or collect the winnings and return to the game. If you lose, your winnings are gone and you return to the reels. 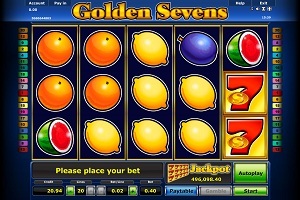 Game Symbols: The Golden Sevens slot machine has a number of different symbols including Bells, fruit symbols like Oranges, Apples, Lemons and Plums. You will of course see a lot of 7’s as well. You can see the different payouts for the different symbols if you click on the Paytable button which is located in the lower part of the game window. The payouts that you will see on the paytable are based on your current stake. If you change the stake amount, the paytable will change as well. Bonus Feature: There are no bonus/free spin features on the Golden Sevens slot machine. It does have a jackpot feature which is increasing as you play along. If you hit fifteen 7’s on the reels you get the jackpot. Betting Options: Golden Sevens have three different payline options. You can play on 5, 10 or 20 paylines across the 5 reels. The number of paylines and the amount you wish to stake is adjusted by using the + and – buttons in the lower part of the game window. Game Features: You can use the Autoplay function by clicking on the Autoplay button which is located in the bottom right part of the game window. To stop the function, just click on the same button again. While you use the Autoplay you will not be able to use the gamble function to double your spin wins.